Early Easter activities were on the agenda when our four Georgia grandchildren came down with their mom for a visit recently. We won’t be able to see them at Easter, so they helped me relive two of my favorite childhood memories – dying eggs and then hunting them with cousins galore. The decorating team is pumped and ready! 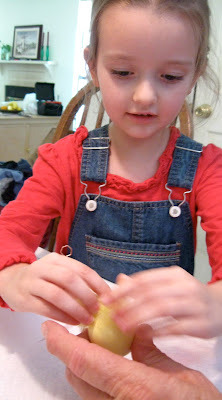 Small hands are busy applying stickers once dying and drying is accomplished. Luke shows off his electric blue egg. Charlie goes monochrome, adding yellow hair to a yellow egg. Soon-to-be-three Stella is enthusiastic about eyes and contrast. Who said “Less is more”? 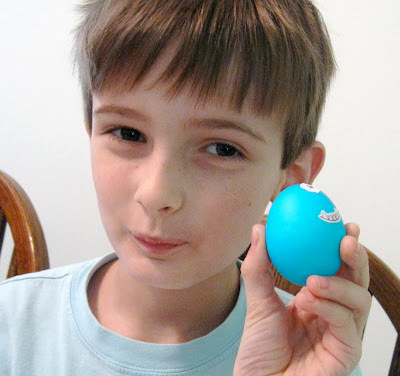 Mom Sarah likes using the “real” eggs for Easter egg hunts, partly as a strategy to limit candy intake. That suited me just fine. 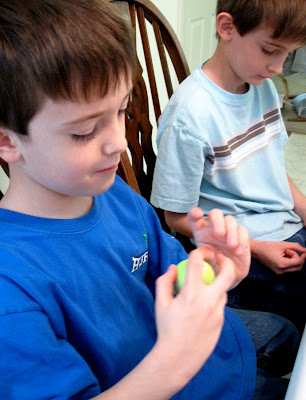 Hardboiled eggs were the Easter eggs my cousins and I hunted. For this year's “early” Easter, Sarah, the Fab Four and I traveled to Hattiesburg to visit my mother. We hid the “real” eggs around one of the patio garden areas at Provisions Living where she has an apartment. After the spirited search, we all agreed the wind was a bit chilly. We hid the eggs a second time in the sitting area near Mother’s apartment. 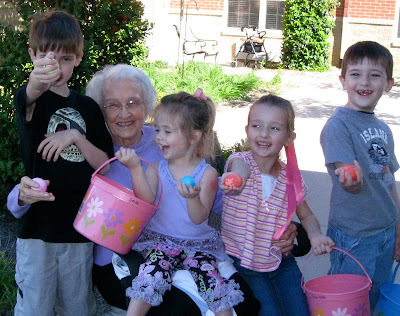 A great-grandmother enjoys a family tradition with her great-grandchildren. I wasn’t acquainted with the huge Easter baskets filled with abundant candy and other goodies until I experienced Easter on the coast with husband Walter’s family. Yum! As a child, though, I don’t recall feeling deprived by the absence of candy treats, maybe because of all the food that was a part of the day’s celebration. Easter was one of the few times we missed church services. I considered that a treat in itself, although I certainly didn’t articulate that opinion. We would go to Sunday School then head to the gathering of my mother’s family. Mother, her sisters and sisters-in-law were Southern country-cooking magicians. The tables were loaded and I loved it! Plus, the food they prepared was always consumed with complementary helpings of non-stop laughter, family stories, and the adults kidding each other and lavishing attention on everybody’s offspring. Who needed candy! How about you? Was candy a big part of your Easter as a child? 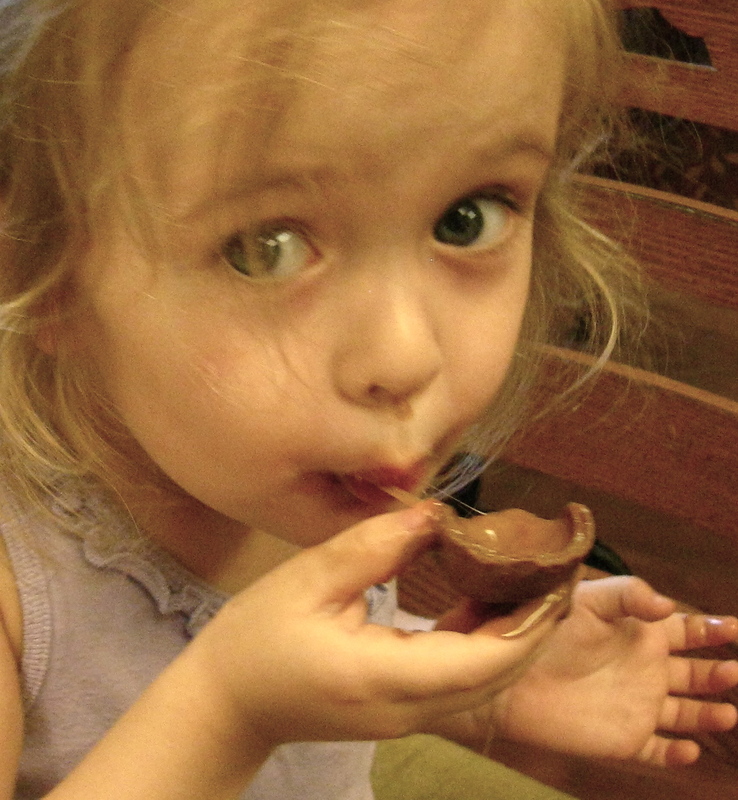 Granddaughter Stella works on a caramel-filled Cadbury egg. What wonderful pictures of the eggs and the gathering!!! And I LOVE it that great-grandmother was able to see all this and be a part of it!! The eggs are too cute!!! When I was little, I really don't remember baskets filled with lots of candy like today. 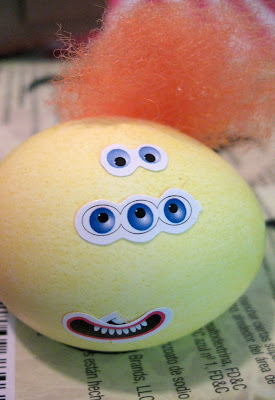 We dyed hard bolied eggs and hunted them, and my favorite part was going to the drug store and buying those tiny little fuzzy chicks that are for decoration. How sweet that last picture is! As a child, we had "goodies" in our basket, but not as much as you often see now. I enjoyed the egg hunt as much as anything else. 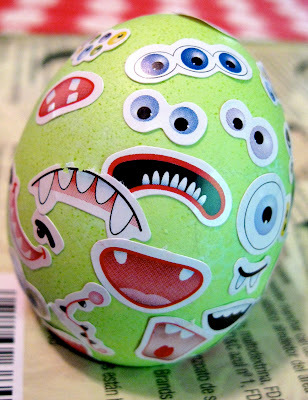 One thing I miss about having children nearby is the dying and decorating of the eggs. That was a definite time of pleasure at our house. I love the creativity! And your little ones definitely show flair! What fun! My kids are already chomping at the bit to color eggs, but we do the hardboiled ones too, and there is no way they'd last til Easter! It is so great that you can have this time with them. Your post reminded me of my mother-in-law, who is not with us anymore. Second to Christmas, her other favorite holiday was Easter. She loved hiding marshmallows and jelly beans in the plastic eggs for our oldest son, and he still remembers that. I try to carry on the tradition, but I really wish she was here to do it. Loved seeing pics of all the kids - looks like they had a great time! Linda, I cannot tell you how much I enjoy your (and Skupie's) blogs. They bring me home again and it is a wonderful feeling. I just think Skupie should blog more often than he does - it is just too long between his writings. 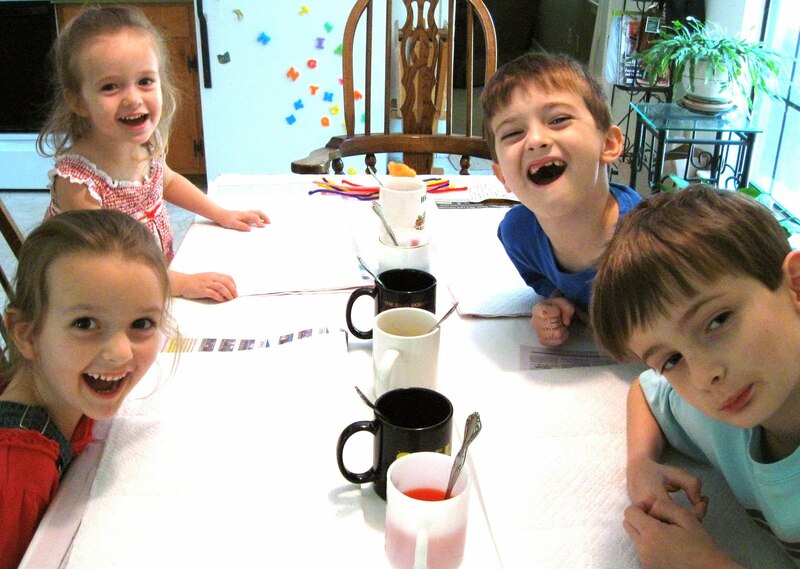 The grandchildren are precious and I would love to be there sometime when they are visiting. Keep writing and I will keep reading. Love to all. 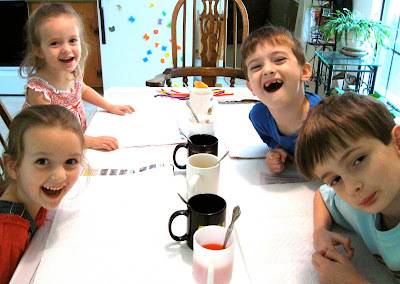 I too love dying real eggs - the smell, the colors, the watching them change in the little cups. As for candy when I was growing up, I don't think they had as many options! Perhaps a chocolate bunny or a few jelly beans is all I remember. 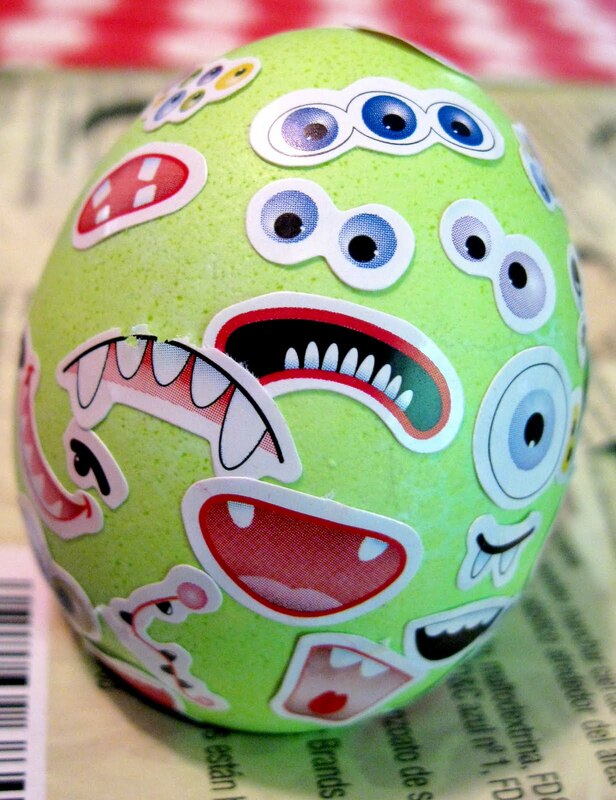 Wonderful way of decorating eggs. We used to roll them down a big slope - and of course they all fell to pieces. The chocolate egg was always a bit of a disappointment to me - it was hollow after all!